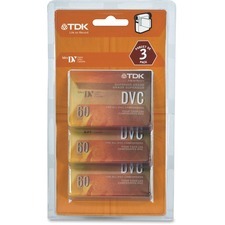 TDK Mini-DV Cassette - MiniDV - 60 Minute - Welcome to TABS! Superior-grade camcorder tapes for digital camcorders combine unrivaled performance and durability with a festive twist. Colorful Designer DVC cartridge designs make it easy to identify a specific tape and facilitate organizing your DVC media library by color. Recording capacity for each tape is 60 minutes. Each comes with its own ultra-durable carrying case, insert card and blank labels. DVM DVC media is compatible with all DVC/Mini-DV camcorders. Superior-grade camcorder tapes for digital camcorders combine unrivaled performance and durability with a festive twist. Colorful Designer DVC cartridge designs make it easy to identify a specific tape and facilitate organizing your DVC media library by color. Recording capacity for each tape is 60 minutes. Each comes with its own ultra-durable carrying case, insert card and blank labels. 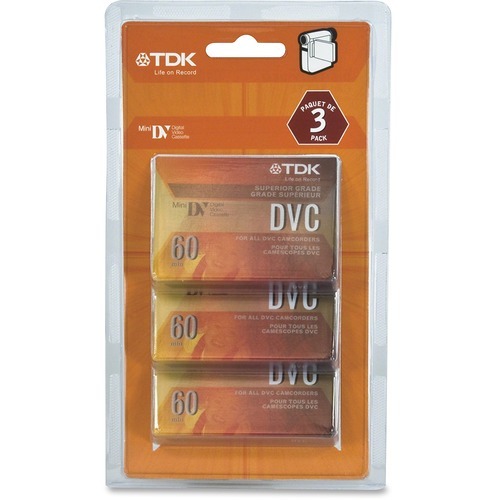 DVM DVC media is compatible with all DVC/Mini-DV camcorders.